Product code: 100100 Category: Fully Composite. 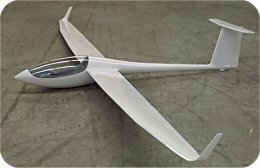 The ASW-28 is a nice semi-scale reproduction of the T-tail glider produced by the German company A. Schleicher, Flugzeugbau, currently in production. 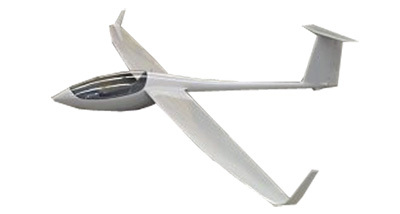 It is the constant evolution of the ASW series and is the new standard class glider. Improvements are triple taper leading edge and high aspect ratio wiglets. This model is best suited for slope flying, but will do well on a good thermal day. Due to its high aspect ratio, the ASW-28 will cover a lot of ground, but due to it’s low wing loading, it has very smooth handling. Building and flying require some skill, thus the designation for intermediate pilot. The kit comes completely finished. The wings are hollow core molded and the ailerons are cut-out. The wiglets are molded onto the wing. The clear plastic canopy is fitted to the Fiberglas tray – with painted frame , wing joiner system is installed in the fuselage. All what’s required is your radio gear. You will need 4 sub-micro servos and a small 4 channel receiver.